The basic rooms. Includes beds, table & chairs and bath. Deluxe room faces the forest. Carmel faces parking and forest. Spacious room, includes sitting area, balcony and 2 sunloungers overlooking the forest or garden. Carmel Suite: elegant luxurious with a salon area, balcony and 2 sunloungers overlooking the forest. Tzameret Suite: Two room luxurious suite with a salon, balcony and 2 sunloungers overlooking the forest. There is only one Tzameret Suite in the hotel. Nestled in the lush green forest facing the sea, this is the ideal place to relax, be pampered and rejuvenate. 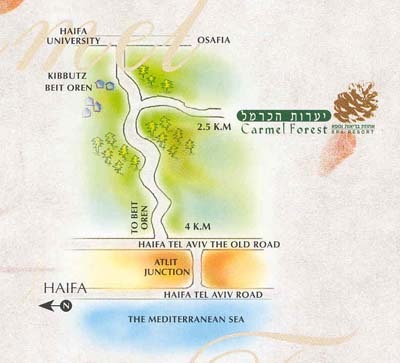 The Carmel Forest Spa Resort, Israel's largest and most luxurious spa, invites you to take time out, to invest in pampering your body, refreshing your soul and recharging your batteries. The Carmel Forest Spa Resort offers the atmosphere and the treatments necessary to relax and rejuvenate in a totally pampering environment. The resort offers dozens of health and beauty spa treatments and a wide range of activities. Workshops, kosher gourmet healthy cuisine and pampering treatments make this a truly life-enhancing experience. The magic words at this prestigious resort are rest and relaxation. The decor is in wood tones and muted colors, voices are kept low, and no cellphones are allowed in public areas. This is an adult spa, with no children under 16 yrs admitted. Each room has a mini bar and coffee/tea corner. Activities include workshops, guided walks through the forest, yoga, meditation, tai-chi, aerobics, spinning, body conditioning and more. view a map showing how to get to the resort. Room rates at the Carmel Forest are half board, and include breakfast and dinner. Lunch is available for an extra fee. Breakfast is served continuously from 7.30 – 11:30 am. Guests may return to the breakfast as many times as they wish during the morning. Every evening a gourmet dinner is served in the hotel restaurant. Dinner includes a buffet of salads and starters and an a la carte main course. The emphasis is on healthy, gourmet kosher cuisine. Guests who want a meal before dinner in the evening can choose between lunch in the hotel restaurant or a light meal in the hotel lobby or at the pool. There is an additional charge for lunch. Kashrut: Rabbanut Chof HaCarmel. Full-time mashgiach, vegetables from Gush Katif, mehadrin chickens. Most cheeses served at breakfast and lunch are mehadrin. See the mashgiach kashrut for details. Date: July 2016. Submitted by: : Abby B. Description: The Carmel Forest Spa truly exceeded my expectations. Carved into a mountain and surrounded by nature, I experienced real serenity on my visit. The hotel itself was incredibly clean, and I could tell how much thought there was put into making the guests feel like they were at an exclusive location. The food was awesome and I loved that it never felt crowded in the restaurant. The only part of the hotel that I wasn't crazy about was the room itself, we paid more for a Tzameret but I can't imagine that it was very different from the lower-priced rooms. We did have a semi-private balcony, but we didn't spend a lot of time there. I will definitely be revisiting the Carmel Forest Spa, and have highly recommended it to friends and family. Date: November, 2015. From: Richard and Leah Z., Comment: We had a wonderful time at the resort. As expected the food was plentiful, gourmet and excellently presented. As a matter of fact at my first meal (dinner) I ordered a lamb dish which was a mistake on the menu and was not available. I ordered an alternate, which was delicious. The head staff was so apologetic that the chef put together a special dish for me alone, in addition to my my chosen dish, which was out of this world. After all that they still gave my wife and I two glasses of wine on the house. We requested and were given a Tzameret room on the third floor, with excellent views. I did not use the balcony as much as I would have liked, just because there are so many other beautiful areas to sit. The spa treatments were very nice, my wife especially enjoyed her facial with Iris. The spa area itself is a bit limited and some spas that we have been to in the US are more elegant and larger. The indoor pool area is top rate with plenty of indoor and outdoor lounges available. The quiet solarium area was also a nice alternative. We checked out of the room at the recommended time, although after packing our luggage in the car, we used the facilities for a few more hours until we had to move on. I would highly recommend the hotel, although it is pricey and a bit difficult to get to (we ended up driving up the mountain in the dark). Thank you for your help with our reservations. Date: October 2015. From Shalom Alexander Comment: We had a wonderful time at Carmel Forest Spa Resort. We thought the dinner might be the best meal we've ever eaten in our lives -- the variety of salads and fresh foods was incredible. The entire spa was beautiful and quiet. We went on wonderful and peaceful walks in the forest. The deal provided through eLuna made the hotel dramatically more affordable than it was on the hotel website, and we would strongly encourage everyone to go to the hotel through eLuna. Date: October 28, 2015. From: Mark C., Comment: Hi Ruth. Roberta and I very much enjoyed our "mini vacation" at the Carmel Forest Spa. The ambiance and accommodations were excellent, as usual, and we found that upgrading to a room with a balcony was well worth it. The spa treatments were first class and the food was plentiful and up to our high expectations. We look forward to our next visit to the Carmel Spa. NIS 180 for one 50-minute treatment (value NIS 375) per room from Carmel Room NIS 1560. NIS 120 for one 50-minute treatment (value NIS 375) per room from Carmel Deluxe Room, NIS 1680. NIS 240 for 2 50-minute treatments (value NIS 750) per room from Carmel Room NIS 1560. The resort reserves the right to change these offers without prior notice. The rates include: Unlimited use of all facilities (excluding treatments): fully equipped “Life Fitness” gymnasium, exercise and relaxation classes, two swimming pools (one covered and heated), Jacuzzi, dry and wet saunas, plunge pools, Turkish Hammam, relaxation terrace-solarium, tennis court. Various activities free of charge: guided hikes in the forest, Yoga, Tai Chi, lectures, and more. Maximum occupancy is 2 people per room/suite. Offers are based on room availability and cannot be combined with any other offer. The hotel reserves the right to discontinue offers at their discretion.